What Are The Chances That Your Vote Makes a Difference? The phrases "Every Vote Counts" and "Your Vote Matters!" are common ones to hear around elections. In most cases, though, elections do not come down to a single vote, so no single vote actually matters. This is especially true of larger elections and elections with one clearly-favored candidate. That would be a boring and mostly uninformative end of the discussion, though. Elections are hardly an individual activity. Politicians, media, and various organizations influence people's decisions to vote and who to vote for, and those people in turn may do the same to those around them. Most people are not media empires or highly-influential leaders, though. They can still, however, influence those closest to them. 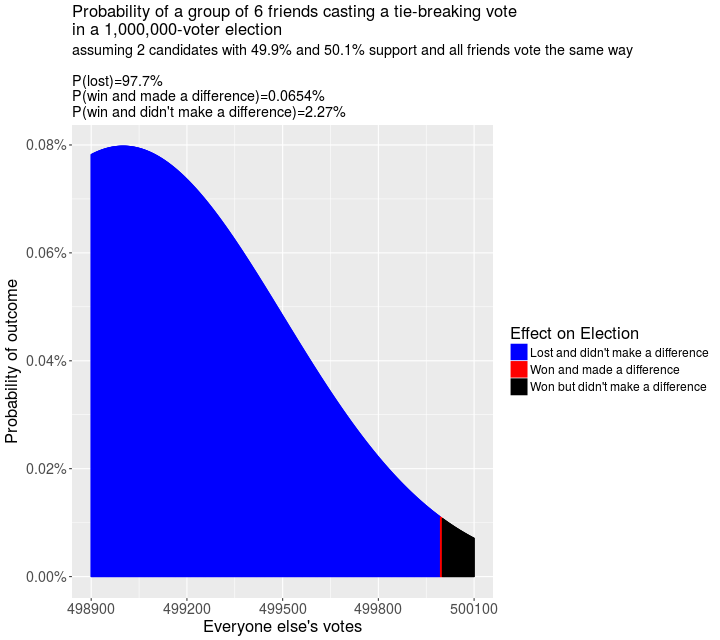 Below I made a little application that shows you what the chances of your candidate(/referendum) winning are if you voted, and what the chances are that you would make a difference in the outcome. Total Added Votes - The number of extra votes added to one side of an election. This would be you plus the number of people that you got to vote who otherwise would not have. Predicted proportion of votes - What proportion of votes is your candidate expected to win? Margin of error for proportion of votes - If you want to provide this, what is the margin of error (95%) of the above proportion? Predicted proportion of votes - What proportion of votes is the main opposition candidate expected to win? This is useful if there are third-party candidates who have a low chance of winning, but would still take a small chunk. Margin of error for proportion of votes - If you want to provide this, what is the margin of error (95%) of the above proportion (for opposition)? "What are my chances of making a difference?" 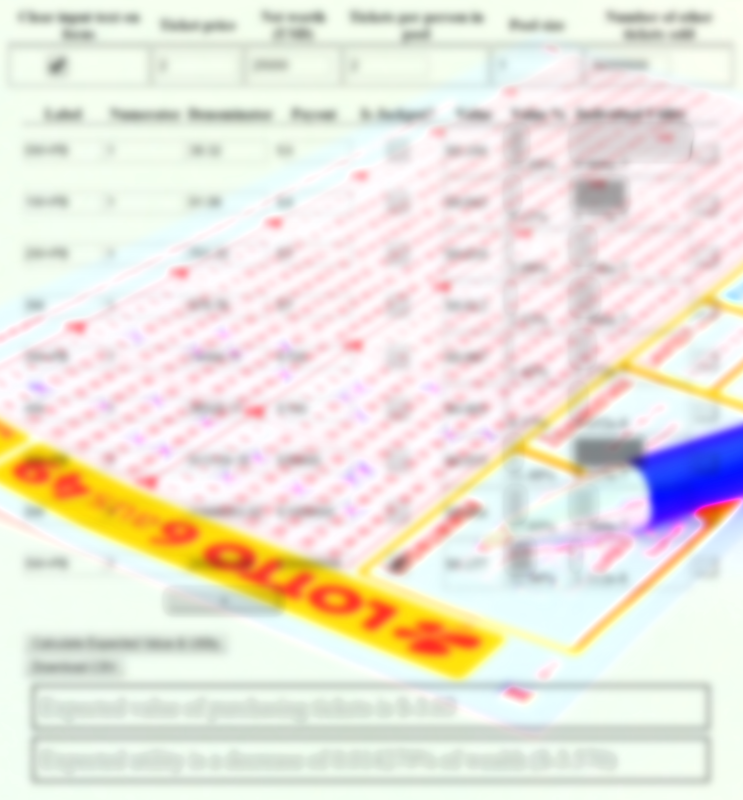 Calculate Probability of Making a Difference! 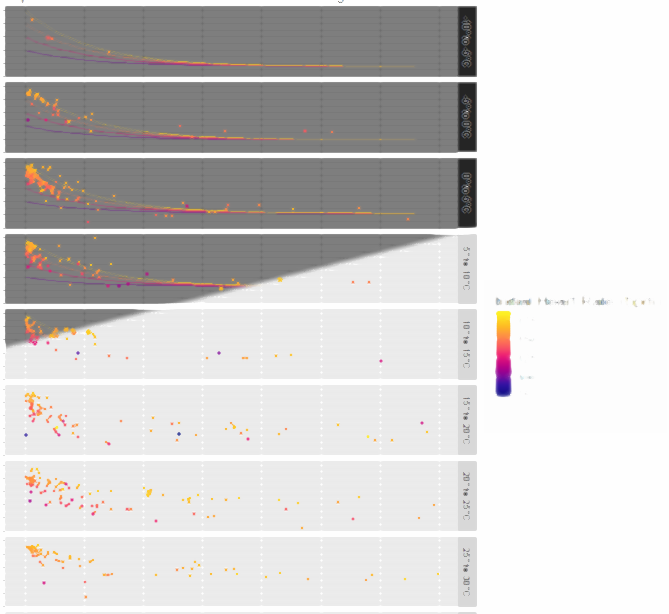 To go through some examples of what these probabilities are like, I whipped up some calculations and visualizations in R to demonstrate basic concepts behind these calculations. 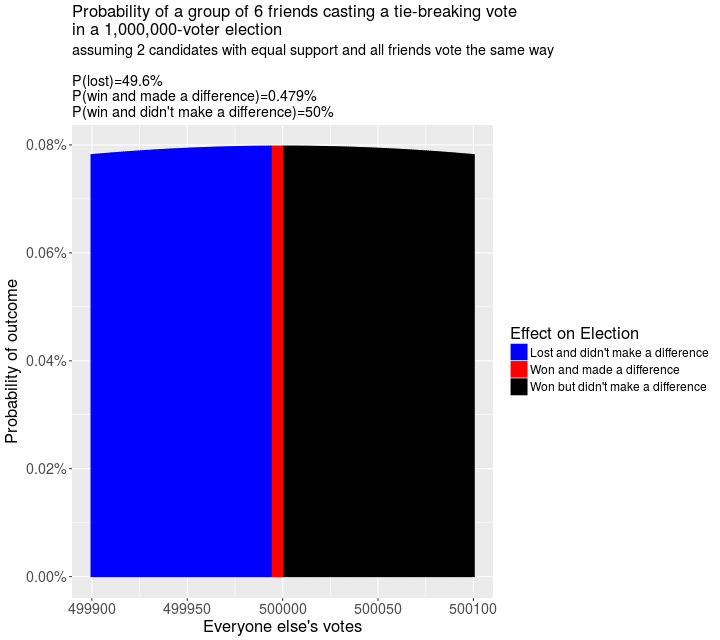 With 5 added friends, the probability of making a difference increases to 4.78%, which is a nontrivial amount, even if it is small. Because the value is closer to the peak of the curve, the amount of probability each additional person adds is roughly the same, just slightly lower. 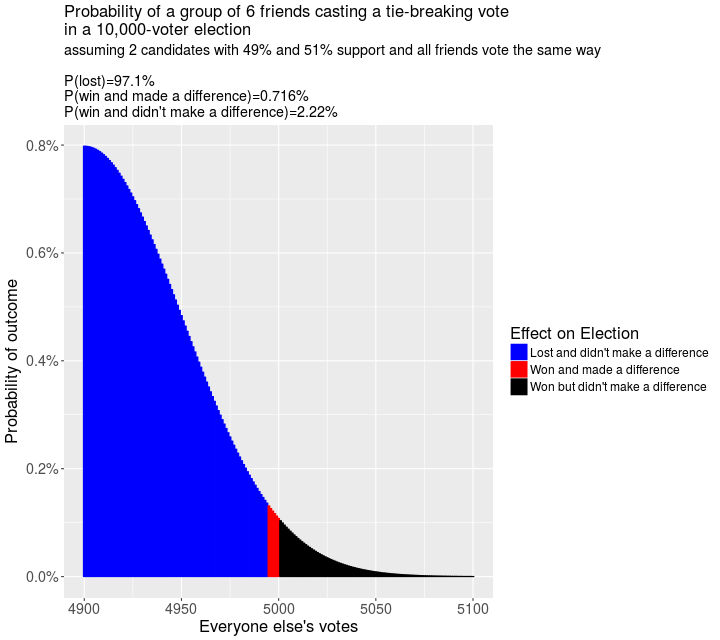 When the odds are even slightly tilted, however, it is much less likely that a group will be able to make a difference. Note that there is a 25% chance that if they do win, then it is a result of the extra voters. This is still as unlikely as one person making a difference with 50/50 odds. Unlike with the previous graph, the probability of winning added for each additional voter increases because it is moving up the bell curve, not down. For very large elections, the chances are pretty small, but the size of the peak grows with the square root of the number of voters, so the effect scales down proportional to 1/sqrt(n_voters). However, if the probability is even slightly off (in this case, 50.1% vs. 49.9%, usually considered statistically insignificant), the probability of making a difference is significantly reduced. 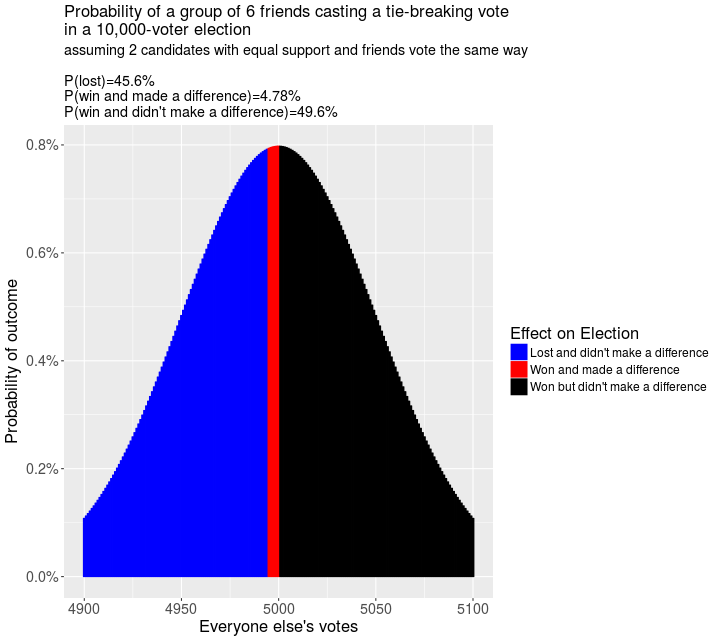 Since most races are nowhere near this close, the effect that the margin-of-error has on the probability means that the chance of your vote or a small group of people's vote flipping the results is averaged over more low-probability regions than higher ones. For larger elections, even if they are "close", chances are that it will not come down to a single votes or even a few votes.